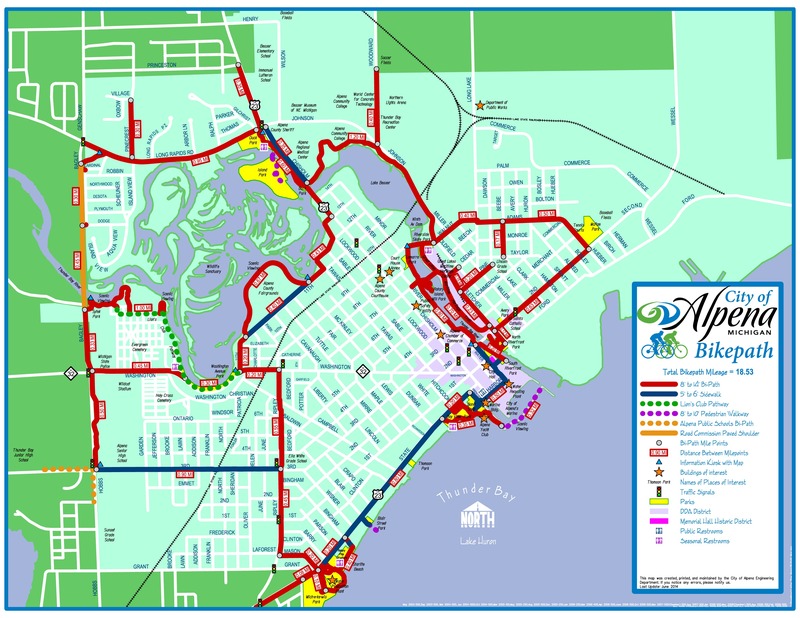 Trail Surface: Packed crushed limestone, asphalt within the Village of Mackinaw City. Elevation: The trail drops gradually in elevation (770 feet) from Gaylord to Indian River, otherwise flat with slight elevation changes. Notes: The mile markers use the historic Michigan Central Railroad numbers from Bay City to Mackinaw City. Mile marker number 121 is north of Gaylord and number 181 is south of Mackinaw City. The North Central State Trail (NCST) has become a premier cycling trail in the Midwest. It is surfaced with crushed limestone and its flat terrain makes for easy cycling through diverse natural beauty. Highlights include the Sturgeon River valley between Vanderbilt and Indian River and the section of trail that runs along Mullet Lake between Indian River and Cheboygan. 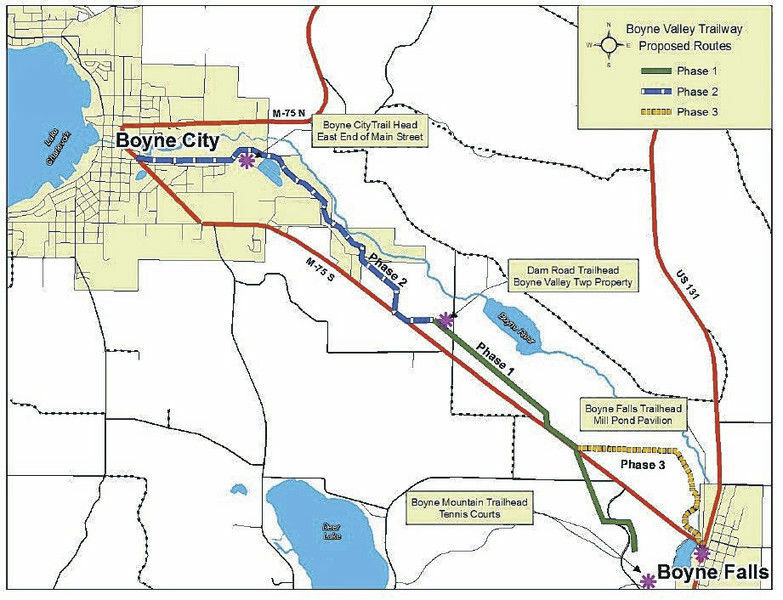 The trail towns of Gaylord, Vanderbilt, Wolverine, Indian River, Topinabee, Cheboygan and Mackinaw City offer plenty of amenities to serve trail users along the way. The improvements to the former Michigan Central Railroad corridor were completed in 2007 by the Michigan Department of Natural Resources. Funding was made possible through a Federal Transportation Enhancement grant from the Michigan Department of Transportation and a Michigan Natural Resources Trust Fund grant, along with support for local communities and organizations. The trail surface is maintained by the Michigan Department of Natural Resources Parks and Recreation Division. Gaylord Trailhead (P,R,A): The trailhead is temporarily located at the Gaylord Youth soccer complex where there is parking and porta-potties. To get to the trailhead from downtown Gaylord take Old US 27 north to Fairview Road and turn left to the soccer fields. Parking is available on the south side of Fairview. Gaylord is a full-service community with hotels, restaurants, shops and a brewery. Coming soon is a downtown trailhead and a trail extension into to town and south to the community of Waters! Gaylord is the southern terminus of the North Central State Trail. The 7.6-mile trail to Vanderbilt passes through a mixture of farmland and forests, goes through two tunnels and has beautiful country views. Vanderbilt Access (P,R,A): Parking is available along E Main Street where the trail crosses. Next to the Village Hall a few blocks north on Garfield Street there is a porta-potty. The community has a general store, bar and restaurant. This 10.9-mile segment is remote and scenic including a four mile segment which goes through Stewarts Creek marsh where beaver are plentiful and the birding is excellent. North of Stewarts Creek trail users will cross the main branch of the Sturgeon River twice and the west branch of the Sturgeon River immediately before the Village of Wolverine. From Wolverine going north you will continue to follow the Sturgeon River part of the way and cross it twice on the 9.6-mile route to Indian River. The trailhead in Indian River, Marina Park, is adjacent to the Chamber of Commerce office on US 27 at the north edge of downtown. You will find parking and many amenities on US 27 which is Indian River’s main street. There are restrooms next to the Chamber Office. Wolverine Trailhead (P,R,W,A): The Village has two parks between the trail and the Sturgeon River and makes a great place to stage a ride. Parking, restrooms and amenities are available at both parks. There is a Michigan Historic Site sign at the former railroad depot (privately owned). The community has a general store, restaurant, bar and a canoe/kayak livery if you want to paddle and pedal. From Wolverine heading north you will continue through the lovely Sturgeon River Valley for 9.6 miles, paralleling the river most of the way. North of Wolverine the trail runs in front of Haakwood State Forest Campground (where you’ll find water and pit toilets) and then crosses the river near the Rondo Access Site (where there is river access, parking and a pit toilet). There is a nice bench near the river which makes a great place to take a break. Indian River Trailhead (P,R,W,A): The trailhead, demarked by the Indian Totem, is adjacent to the Chamber of Commerce office on S Straights Highway at the north end of downtown. At the trailhead you’ll find parking, restrooms, water, picnic pavilion, playground, and interpretive signs. You’ll find visitor information at the Chamber of Commerce. Indian River is a full-service community with hotels, restaurants and shops. This scenic 5.6 mile segment of trail features the “spreads” of the Indian River as it enters Mullett Lake and offers many views on the way to Topinabee. Topinabee has a lovely lakeside park near the former depot (now a library) with a swimming beach. Topinabee Trailhead (P,R,W,A): The Topinabee Park on the east side of US-27 serves as a trailhead and has parking, restrooms, water, pavilion, interpretive signs, swimming beach and a playground. It is adjacent to the historic depot which now houses the local library. Topinabee has a general store and a restaurant. About half of this 11.9 mile segment is along the lake and the other half rolls through forest and farmland. From Topinabee the trail continues north along Mullett Lake; at times the trail is directly adjacent to the lake with incredible views. At other times it runs behind the historic resort communities along the lake. Enjoy a rest at the Long Point historic sign or at the small township park on Mullett Lake near Bayshore Road. This park is your last view of lake as the trail cuts north, crossing US-27 towards Cheboygan. Take note when you see the tops of trees along this stretch and you will notice down below small creek crossings and the elevation of the trail. The trail goes through rural farmland before it reaches Cheboygan. Just as you enter the City of Cheboygan you will see the turnoff for the North Eastern State Trail. Stay left and you will soon arrive at the Cheboygan Trailhead. About 1/4 mile south of the Trailhead (just south of W Lincoln Ave) the North Eastern State Trail branches off the trail and goes southeast toward Aloha, Onaway and Alpena. Cheboygan Trailhead (P,R,W,A): The Cheboygan Trailhead is located between Lincoln Avenue and Taylor Streets just east of Western Avenue. It has parking as well as trailer/RV spaces, restroom, water and a pavilion. Cheboygan is a full-service community with hotels, restaurants, shops, a brewery and beaches. To get to downtown, continue north on the trail about a half of a mile and turn right on Division Street which will take you to the center of town. Running entirely along the west side of US 23, this 16.3-mile segment of trail runs primarily through forest land with limited views of Lake Huron. About eight miles northwest of Cheboygan a small sign will indicate MDOT roadside park. If you take the small connector trail and cross the highway there is a park with pit toilets, water, and a picnic area. Head down to the shore for an excellent view of the Mackinac Bridge. Stop for a rest at the Freedom historic sign or take some time to visit Historic Mill Creek Discovery Park (fee required). Mill Creek is an interesting destination with a reconstructed saw mill run by water, interpreters and a zip line. From the Park the trail continues another three miles, across US 23 into Mackinaw City and ends at the Mackinaw City Trailhead which is the trail terminus. From the trail It is an easy walk or bike ride into Mackinaw City with its many attractions. 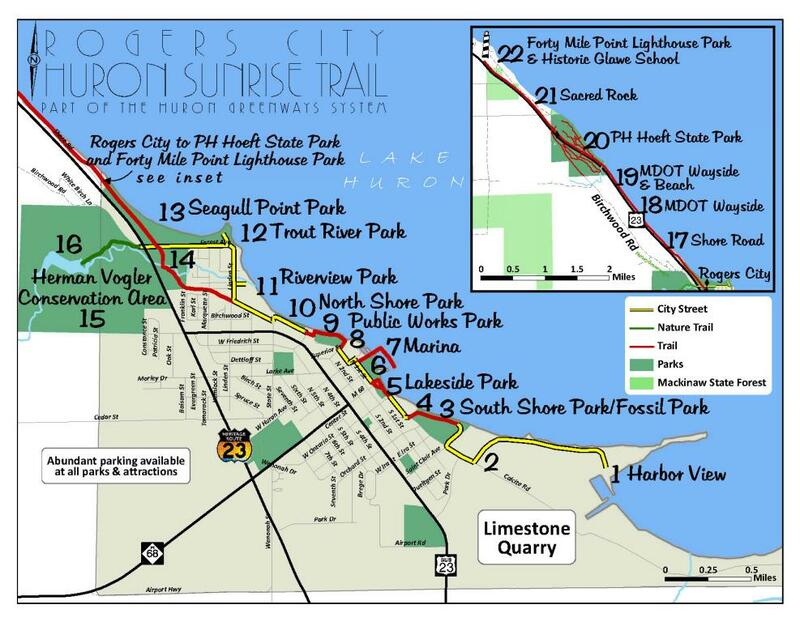 Mackinaw City Trailhead (P,R,W,A): The trailhead is located on Mackinaw Crossings Drive just east of Nicolet Street. Here you’ll find parking, RV/trailer parking, restrooms, water, interpretive signs and a pavilion. Mackinaw City is a full-service community with hotels, restaurants and shops. 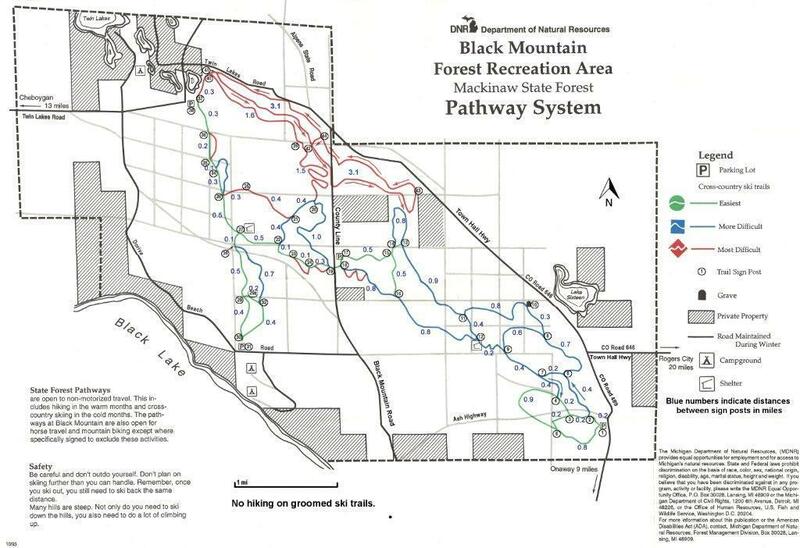 Those wishing to continue their journey can head southwest from the trailhead on the North Western State Trail to Petoskey or take a ferry to Mackinac Island and enjoy cycling around and through the Island.